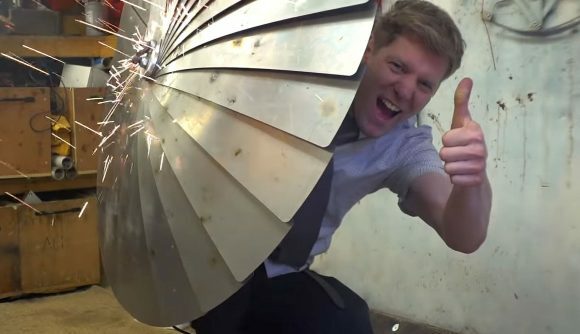 YouTube engineer Colin Furze has made a real, working version of Sekiro’s wrist-mounted unfolding Iron Umbrella shield, and somehow not blinded himself in the testing process (found via Kotaku). Furze has put out two videos on the project – one showing how it was made, and a shorter one testing its effectiveness against dangers such as fireworks and plain old fire. You can watch both below. It’s entertaining viewing, and not just for the connection with a brilliant game that we awarded 9/10 (see our Sekiro review if you’re still on the fence). Furze grapples with the engineering challenges of making an unfolding metal shield that can protect the whole body while also collapsing to fit on the wrist, prototying and rejecting several designs before landing on the winning idea. He then shows a masochistic disregard for personal safety that would make a Souls player proud as he tests his creation against a flamethrower, and feigns enjoyment as fireworks bounce against his crotch. Like I said: entertaining viewing. And here’s the testing video. Skip to 2:41 if you just came here for “firework to the crotch” (there’s no shame in it – I put it in the headline, after all). Madman. Furze has also made a real-life version of Sekiro’s loaded axe prosthetic weapon – the video for that is here. If you’d like to do some engineering of your own, our Sekiro Lapis Lazuli guide will help you track down those elusive lategame upgrade materials, while our Sekiro shinobi tools guide tells you where to find all your prosthetic gadgetry. Sekiro: Shadows Die Twice is out now and it’s really, really good. I found it harder than Dark Souls or Bloodborne at first, but once the combat system clicks it’s amazing how easy and natural it suddenly feels. It’s quite the journey, and if you’re up for the initial challenge, I strongly recommend you check it out.